Last year, I found a Craigslist ad for a motion picture that was being filmed in Albany. They needed cars and drivers for an action scene that would be filmed on the I-787 elevated bridges. I took a chance, filled out an application, and next thing I know, I’m getting a call from a Columbia Pictures casting assistant. My car, my 1991 Pontiac 6000, would work out great as one of the “car extras” in the upcoming SALT movie. Yes, that action thriller starring Angelina Jolie that’s supposed to debut this summer. Filming took place last year, and any fantasies I had of being in a scene with Angelina Jolie were dashed about 15 seconds into my first casting call. The cars would be used in a “traffic jam” scene, and until that scene was to be filmed, we were all parked in a warehouse down by the Port of Albany. We were fed (very nicely, I should say), and we all networked and commented on everybody’s cars – there were some tuners and some junkers and the like. Eventually we did get out to the “set” – essentially for me that was the on-ramp from Colonie Street. While I waited in the car for the signal that would tell all of us to drive forward or drive backward or reset or whatever, I noticed a production assistant adjusting something on the front of my car. Then I saw him go to the rear of my car and place something there as well. “Well, we’re recreating Beltway traffic in DC, so your car now has a new license plate for Washington, D.C.” he told me. I later looked and saw – yes, my New York plates were now covered with fake DC plates. I guess that means my car was ready to be in the movie. Now technically, “in the movie” is still a question mark. I probably saw Angelina Jolie for all of about maybe 15 seconds of filming, and I don’t even think I saw a camera near where I was stationed. In fact, if my Pontiac 6000 makes it into more than three frames of film in the entire motion picture, I’ll be surprised. However, at that point I wasn’t doing it for the fame or for the glory. It was just for a paycheck – enough money to get a new camera to replace my aging Nikon D70. So on Monday, May 4, 2009, after working as a “car extra” on the film for about a week, I received my first check from a company called Entertainment Partners, who administers payment to the extras on motion pictures. When I was hired for this film, I was quoted a price of $85 for eight hours’ work, plus time and a half if my work day exceeded eight hours, and double time if the work load exceeded 12 hours in a day – plus $35 for my car. Taxes, of course, would be removed from the final check. I also mention this because at the end of my first day of filming, I had to fill in a special voucher for non-union employees (those who were driving “picture cars” that didn’t get a waiver to SAG), and the PA at the table filled in the pertinent breakdown of hours and initialed the form. As you can see from the attached form, it was filled in by the staff person involved with the production of SALT, and was initialed for payment. Yes, I worked from 530am to 630pm, with one hour for lunch. The “Auto” is circled to denote a $35 payment for use of my Pontiac 6000 for the day. You can also clearly see, in the box marked “BASIC RATE,” the handwritten notation “85/8” by the production person, who initialed the document “DC.” The blue and yellow sheets were kept by the production company, while I was issued the pink carbon you see there. Notice anything odd here? 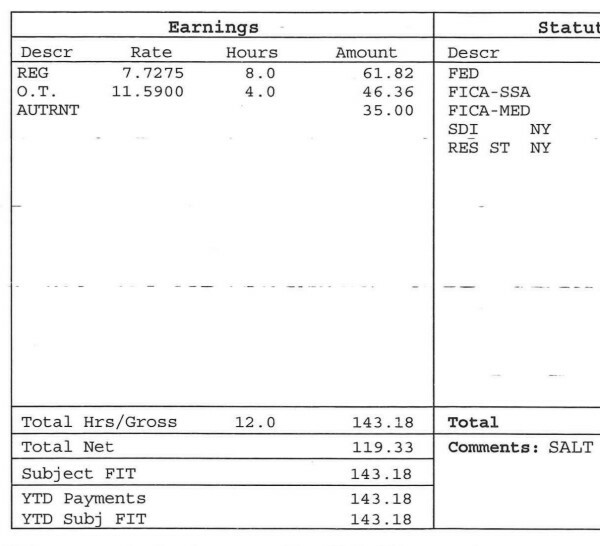 The rate of payment for 8 hours of work is not $85, but just a little over $61. And the overtime is a lot shallower than expected. In the end, there was a discrepancy of $50 dollars from what I was told I would receive. After the taxes were taken out, I received a final net of $119 and change. 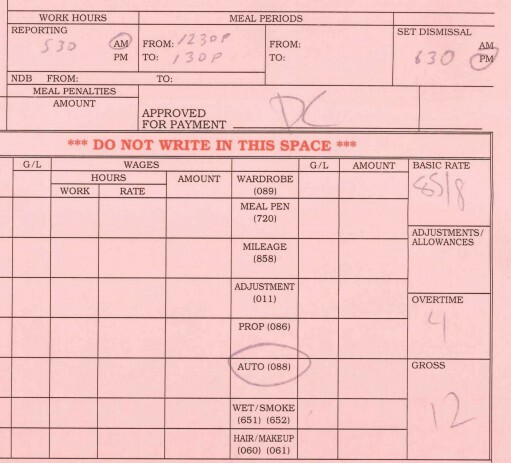 The non-union extras for SALT were supposed to receive $85 for TEN hours of work, not eight! Scuse me while I pick my jaw up from the floor. Apparently the production company or the casting people either received bum information or went with incorrect information or did something wrong, because I’ve got six vouchers that all say 85/8. So I asked this person again, what’s going on here? “The rule is $85 for 10 hours work, and then overtime after that. We’re not contracted for the rate that was printed on those vouchers. When we saw those, we immediately knew that was a mistake, and we corrected it. So you only get $85 for 10 hours of work,” she told me. Sorry, my jaw fell on the floor again. What in the world’s going on, I asked. Umm… you are aware that the casting people, along with the cast and crew and all the expensive equipment, are already on their way to Los Angeles? And that any numbers they used were local numbers at the hotel / base camp they stayed at during the production of this film? Yeah, it fell on the floor again. I’m not even going to bother picking my jaw up at this point. The next day, I contacted Entertainment Partners again and asked if there had been any change in the situation. No change. The production department was in talks with the casting department regarding this film, and that it should be resolved between them. In the meantime, Entertainment Partners will send out the checks for the amount they were originally contracted for – $85 for 10 hours work. It meant that despite what I was told – and what was written on the slips – I was going to get shortchanged. Unless I did something about it and stood up for my rights. I then mentioned that I still had my pink receipts from each days’ shooting, along with the pay stubs that I received. And if the situation was not resolved, I could make copies of those receipts available to any media outlet – from Variety to TMZ – in a heartbeat. Within 24 hours, I received a phone call back from Entertainment Partners. After further discussions, the company had changed their policy. All the car extras would receive the original amount promised on the pink slips – and would receive an additional check to cover the discrepancies from the previous payments. Of course, this probably means that any footage with my Pontiac 6000 in it has probably been left on the cutting room floor. Which would be sad, it may be the last time I ever see my old car (it died last March after 153,000 miles of service). But it doesn’t matter. I can still say that I worked on a Hollywood motion picture, and can cross another thing off the life list. And the money I earned from that movie shoot, along with every other penny that I scrimped and saved to get, went toward the down payment on a top-of-the-line Nikon D700 camera. So in the end, it all worked out.